Swisher® Trail Mule ATV Trailer goes where others can't with loads up to 300 pounds! Quite simply the most versatile ATV Trailer on the market. 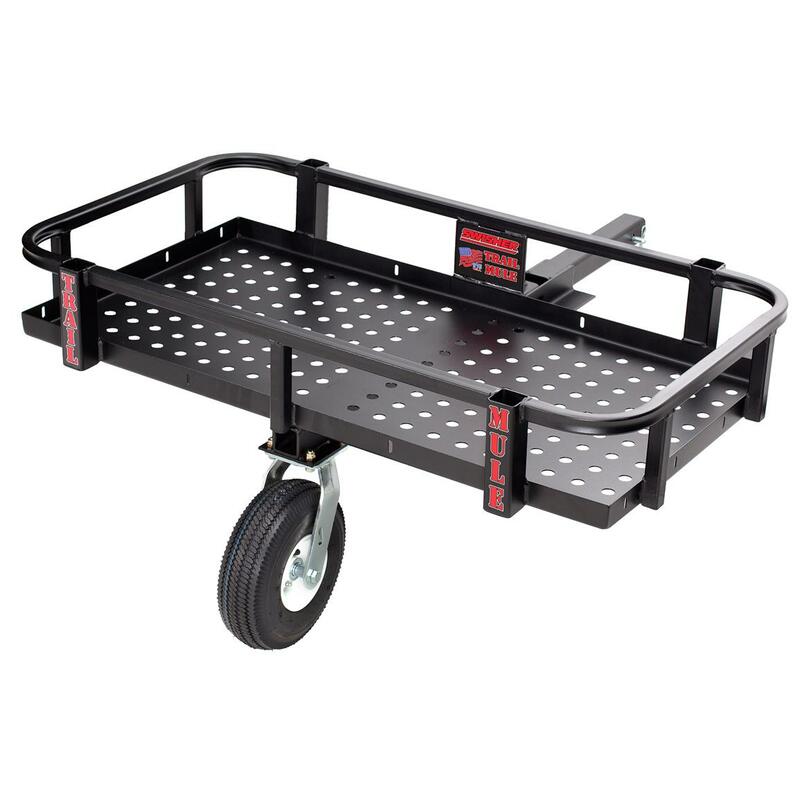 The innovative single wheel design allows it to go places that other trailers can't, and the heavy-duty caster wheel tracks behind your ATV or UTV while providing superior maneuverability and stress-free backing. The Trail Mule easily adjusts to an upright position for transport and storage, and is built to last with all-steel construction and a powder-coat finish. It attaches easily to any 2" receiver and it can be fitted with stakes to control your cargo. Proudly manufactured in the USA. Interior dimensions: 42 1/2 x 22 1/2"
Overall dimensions: 49 1/2 x 44 1/2 x 21 1/2"
Please Note: This item is shipped by commercial carrier curbside. This product Ships in 1 Box, Measures 9.5"l. x 45.75"w. x 32.5"h., and Weighs approx. 80 lbs. No expedited delivery. High-value orders require a physical street address, otherwise insurance costs will be added to the shipping total.